The Sabertooth Tiger is the best tameable animal in the game - that's a fact! 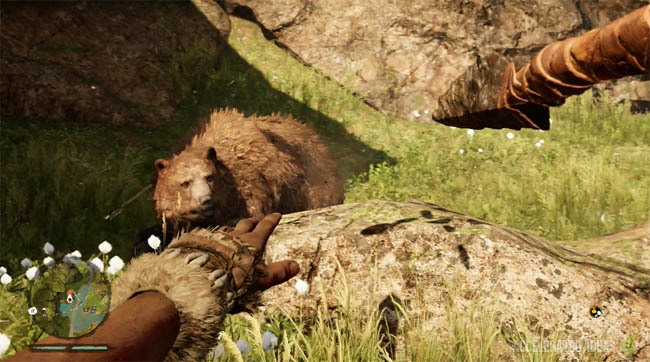 He's not the easiest animal to find though and there's only one good location early in the game to tame him. In this guide you'll find details about this location and quick guide to get this powerful beast on your side. First some quick stats to make you realise why this animal is so good!! Perks: The fastest beast in Oros. As you can see from the list above, this animal excels in almost every department and the line about him being the fastest animal in Oros….YES I agree whole heatedly with that! Once you start riding the Sabretooth you won't ever want to walk anywhere again; he glides elegantly through the forest, outrunning other predators and any tribesmen that come too close. It will cost you 3 Skill Points to reach the Apex Predator level which is essential if you want to tame a Sabretooth Tiger. I found that the best location for this beast was in the south of the world map. To get there you'll need to complete the first few missions, especially the one where the dam gets attacked and you need to defend it (Attack of the Udam). After that the three specialists (Wogah, Jayma and Karoosh ) will appear on the world map . At this point there's enough terrain revealed to let you venture East and then South. Take a look at the image above and study the location carefully. 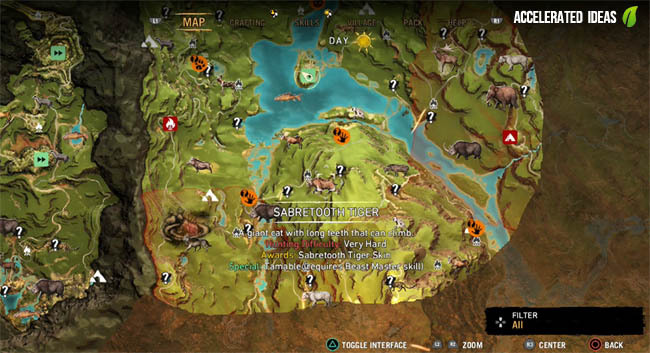 As you can see the Sabretooth animal icon has been highlighted, showing you the exact location where you can tame this animal. As luck would have it when I approached this location on the map, there were tribesmen already fighting the tiger. All I had to do was finish them off and get the bait ready. A quick selection from the Menu wheel to select bait, then a quick throw by pressing R1 and the bait was planted in front of the beast. It only took a split second before the beast started eating it. Then I immediately approached the beast, held down square in anticipation and after a brief pause and an almighty roar, the elusive Sabretooth was on my tamed animals list. 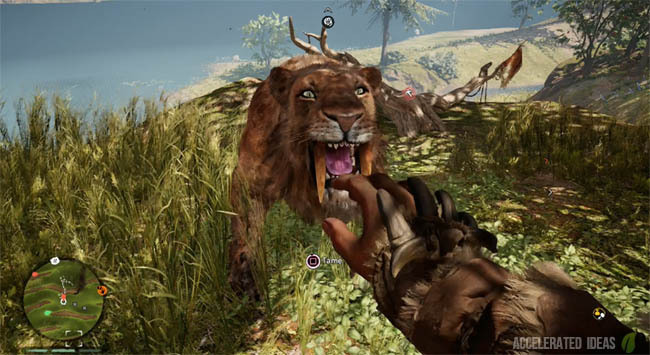 There's no denying that the Sabertooth is a deadly ally in Far Cry Primal. His speed and strength mean that he can approach enemies quickly and kill them in a matter of seconds. In most cases he is fast enough to start clawing enemies to death before they realise what has happened. The only situation to watch out for is groups of tribesmen which tend to surround a lone beast, giving the animal a greatly reduced chance of survival. Riding animals isn't something that you can immediately do after you've tamed a beast. You MUST have found Karoosh the Warrior and convinced him to join your village. This quest only takes a few minutes to complete and the map icon should already be on your map if you're at the same point as I was. After Karoosh is in the village check the Skills menu for Fighting Skills (Karoosh) taking note of the Beast Rider skill which can be unlocked for 2 Skill Points. 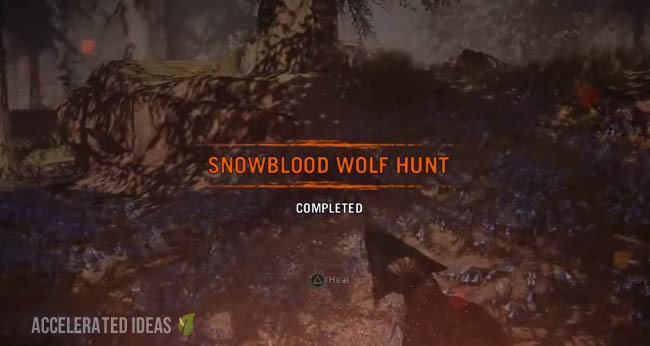 It's not the first in the tree (it's actually third) but once you upgrade his hut enough and have spent your skills points the new rideable skill is yours.